BTC - Take a photo and show the rest of the world it's always right to tell the truth; especially when the media and the government won't. “There’s a new central hub and unless done properly your ID provider knows your date of birth and potentially every other piece of information along with your transaction history,” says IdentityFinder's, Aaron Titus. Governance- a gelatinous term used by corporations and powerful NGO's- was clarified by Grant in intital remarks for the workshop. Examples of enmeshed public identity exchanges presented were NACHA's administration of government-based electronic funds transfers and a Smart Grid proposal for energy conservation and evaluations. Identity Ecosystem Consortium organizer, Kaliya Hamlin, then called for definition to the broad issue of "trust"; which has distinctions over the public and private sector for NSTIC. The jury is apparently still out. Breakout sessions this afternoon absorbed legal, technology and policy infrastructure analysts to determine the pecking order of NIST's developing steering groups. With privacy concerns hanging so heavily in air, one had to wonder whether a privacy advocate's appearance would be treated as an endorsement or as an effete stakeholder as part of the steering committee processes. "I don't think it would be endorsement in this context. It feels far from endorsement. There's a lot of real, technical stuff going on here that matters," said Lee Tien, an EFF attorney towards relevance in NSTIC's steering group. A diplomatic appearance from a very nervous ACLU counsel, Jay Stanley, resulted in a pointed threat level comparison of national ID programs to "the nuclear bomb"of American civil liberties. Stanley left the podium with "campaign or not to campaign against" as the question between terms of privacy and the NSTIC proposal. 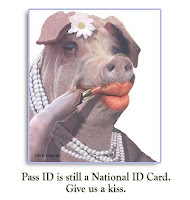 The Obama Administration's priorities are reputedly low towards Real ID, the U.S.' current national ID card program. That may be due to recent efforts to achieve similar ends in successive backdoor public-private programs hinging on involuntary data collection: the RIDE initiative, biometric worker ID cards and NSTIC, a universal online identifier compared to OpenID. You can review today's workshop archives here. BTC- The following statements are based on a reorganized paraphrase of a 2008 California Real ID Certification quarterly report. Upon reading the Customer Impact portion of the report, I discovered requiring license applicants to provide a SSN# or W-2 forms is part of a State's ability to become Real ID certified or materially compliant. This particular benchmark may sound redundant if your State has adopted the E-Verify system. E-Verify currently uses a web-based data entry system known as EVVE and SAVE, for immigrants. "There are five national verification systems required by the REAL ID Act. However, only two (legal presence and SSN verification) of the five required electronic verification systems exist today. The remaining three systems for passport verification, birth verification and the all-drivers pointer system still require development." "Electronic verification" became a common phrase read throughout the document as a key part of Real ID compliance. It is not a jump to connect that E-Verify may actually be the missing link in public awareness, recognizing it as the other Real ID database. "The development of a national DL/ID verification system is required to achieve full compliance of the final REAL ID regulations. This system would be used to ensure the applicant has terminated, or is terminating, the DL/ID card issued by another state prior to the issuance of a new DL/ID card." "The Records and Information from Department of Motor Vehicles for E-Verify (RIDE) initiative seeks to increase the effectiveness of E-Verify by automating motor vehicle document (e.g. driver’s license, driver’s permit, or state-issued ID card) verification between state Motor Vehicle Agencies (MVA) and E-Verify employers. In approximately 95% of the more than 12 million employment authorization queries E-Verify received during FY2010, employees used a driver’s license, driver’s permit, or state-issued ID card to establish their identity. The RIDE initiative enhances E-Verify by providing the ability to validate the information entered by an employer from an employee’s driver’s license, driver’s permit, or state-issued ID card against MVA data. E-Verify determines if the expiration date of the driver’s license, driver’s permit, or state-issued ID card as entered by the employer indicates that the employee presented an unexpired document to the employer. If E-Verify determines that an expired document was presented, E-Verify prompts the employer to enter a document that was not expired on the date of hire." E-Verify as RIDE would be a national database which would exactly determine if a State drivers license is "terminating" or expiring. It is now painfully obvious that E-Verify as RIDE would require you to have a nationalized ID card to legally work in America, as an American or an immigrant. It is designed to collect drivers license information, permits and State issued ID cards. "The E-Verify program may share relevant driver’s license, driver’s permit, or state-issued ID card information (as entered into E-Verify) with state MVAs for verification purposes." This national ID database would be administered by the information clearing house known as, AAMVA. license, permit, or state-issued ID card, as presented for establishing identity on Form I-9. E-Verify provides new fields for employers to enter relevant identity document information from Form I-9 as part of the RIDE enhancement. The MVA databases contain biographical information collected from individuals who have applied for a driver’s license, driver’s permit, or state-issued ID card through a state MVA. The state MVA owns the data in the system that is being queried by E-Verify. This connection is strictly limited to the transfer of relevant driver’s license, driver’s permit, or state-issued ID card information for the purposes described in this PIA Update. MVA systems do not retain any data transferred as a result of an E-Verify query, nor does this connection permit MVA access to the E-Verify system or its records. Information from the MVA databases helps to verify the documents an individual presents to establish identity in the employment eligibility process." The MVA systems won't hold that information, but AAMVA will! Mississippi, the only State to pilot the RIDE initiative, might be exactly right to demand the US government try a different federal contractor - at least one who isn't in the data brokerage business. 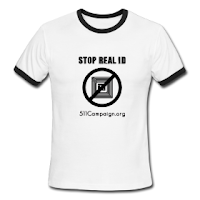 For the rest of us, you have until 5PM June 8th EDT to defend your right to work in America without the aid or defense of a national identity database program known as Real ID. BTC - It might be time to upgrade our approach. It looks as if the database state is evolving and beating the RFID chip on its own. The "chip" as we have known it will reach obsolesence soon as it moves to tags without microchips. However, that has not ended the quest for tracking information from inside of your body. If there was a technology that could survive digestion, would you dare eat it in the first place? Some of the first lessons we learn in life on planet earth is that we don't eat products like pennies and plastic junk. From a practical standpoint, RFIDs are not food. The jury may still be out on whether or not RFID technology is safe to ingest in pellet forms. Just because they created a neat invention doesn't mean it's safe to use; look at cellphones. Several films explore the pratfalls of biotech surveillance in pill form, but Code 46 fits the longterm scenario best. In Code 46, behavioral overrides and genetic adjustments are ingested in pill form or are injected. Papelles, or biometric identity and insurance documents, are issued based on genetic predisposition and class distinctions. A black market for papelles evolves. The plot revolves around attaining passable identity called "covers" to escape the harsh, unprotected life of an ecologically barren wasteland, home to the struggling underclassed, criminals and DNA rejects in exile. Code 46's dystopian society utilizes human cloning and subsequently surveils the consequences of clandestine romance through an alarming viral technology to prevent unconscious inbreeding. In realtime, or today's science breakthroughs, scientists can now build complicated silicon DNA molecules to completely replace or augment "faulty" genetic structures. You may eventually be able to insert a nano-RFID into an RNA strand. If you are both a scientist and a eugenics scholar you might justify deleting faulty genetic code or human genetic "garbage". If this becomes public policy or governance then employees may be altered to fit the companies they work for or governments may ask citizens to make a few mandatory adjustments so the desirables have and the undesirables don't. That's a long drive away from the little RFID tag, but it gives you a window into the kind of future where the strawberry you ate at work today at 11:59 AM will be used in a Human Resources meeting tomorrow. BTC - Wyoming eats the chip.